(yWeekend) The Li Yuchun Family Planning Advertisement Affair. By Wang Xiaojing. July 2, 2009. Recently, a news report titled "Li Yuchun in family planning publicity advertisement" was red-hot on the Internet. The publicity poster showed Li Yuchun in a field of colorful flowers under the slogan: "It is just as good to have a boy as a girl; a girl is also a descendant to continue the family line." Originally, this was believed to be a spoof. Upon checking, this advertisement was located in Longsha town, Shizhu county, Chongqing city. A netizen had passed by the location, got surprised by the sight, took a photograph and then "shared the resource." The comments came in quickly. Someone said in astonishment: "This town government is very progressive!" Some made fun of the matter: "I am still unsure whether this one is a boy or a girl." Once against, Li Yuchun was made fun of by her opponents over her controversial "neuter gender." The management agency for Li Yuchun was angry about violating her image rights. They have just sent a letter to the Longsha town government and they are not excluding the possibility of taking legal steps. Director Zhu of Longsha town's family planning office told our reporter on June 29 that they had no intention to defame Li Yuchun and they have taken the advertisement down. He also disclosed the process by which this advertisement was erected. Although it was a twisted journey to obtain this interview, it was a surprise to find the relevant department being quite cooperative in clarifying how this Li Yuchun's family planning advertisement came about. On the afternoon of June 26, our reporter called the publicity department of the Shizhu county party office. When the person-in-charge heard about the purpose of the interview, they referred us to the News Department director named He. Office and mobile telephone numbers were provided to us. After two days of trying, the reporter was still unable to reach to director He. Finally the reporter sent an SMS to explain her purpose. At 10am on June 29, the reporter received an SMS on her mobile phone. The message said that the advertisement had been taken down and then all details can be obtained from the Longsha down family planning department. Director He explained that he had not called back because he thought that it was "a request for tickets/gifts." Director He said: "This incident has taken place. If it is wrong, then it is wrong. It is no use to cover up." Afterwards, the reporter called director Zhu at the Longsha town family planning department. He had a thick Chongqing accent, which is hard to understand. Although he agreed to take an interview, the reporter could sense that he must be very irritated over the whole affair. Director Zhu said that the advertisement had been removed on June 23. Director Zhu told our reporter that Chongqing will be holding a citywide family planning work conference. 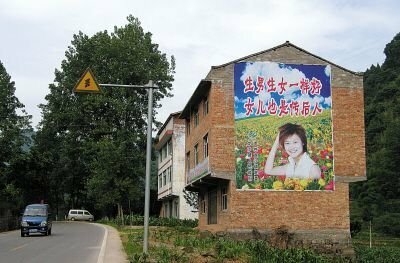 In order to create an enthusiastic atmosphere, the various towns in Shizhu county put out advertising posters. He emphasized that the Longsha town family planning department was only responsible for choosing the sizes and locations of the advertisements. The content of the advertisements was created by an advertising agency, which chose the image of Li Yuchun." "As shown on the Internet photo, we chose the wall on which the poster was hung. It was eye-attracting to have a poster in that location. It will draw people's attention and have good advertising effects. Therefore, we measured the size of the wall and we gave our measurements to the advertising agency. They provided the poster. As for the slogan 'It is just as good to have a boy as a girl; a girl is also a descendant,' that was the universal requirement from the county family planning committee." After the poster was completed, "we did not send anyone over and they did not ask us to send anyone over. Perhaps the county family planning department might have sent someone over to look it over. But that person was only looking at the slogan, not the illustration. Afterwards, we found out that the designer of that poster at the advertising agency was an 18-year-old girl." Director Zhu located that girl later and he asked her why she used Li Yuchun's photo for a family planning advertisement. "She said that feudal thinking is more prevalent in this mountainous region, so that many people value boys more than girls. Li Yuchun is a relatively successful girl. Therefore she thought that Li Yuchun could be used to promote family planning there with good effects. If the locals have a girl, she could be as successful as Li Yuchun and have a high social standing. She thought that it would be a good thing. She did not think too deeply at the time." Although the Longsha family planning department never participated directly in the production of the advertisement, it has ultimate responsibility for its appearance. Director Zhu said: "This was definitely a mistake in our work. We had a weak awareness of the law. There is absolutely no intention to blemish Li Yuchun's image, and we are not treating her as a boy as suggested on the Internet ... She was number one in the Super Girl competition back then, she is from Sichuan province, she is one of us, right? I never thought that the advertisement would be posted on the Internet so that netizens can use it to attack Chunchun. At the time, we only thought that this was a public interest advertisement without any commercial intent. We never imagined that it would be hyped up so much." The reporter then contacted the advertising agency which was responsible for producing that advertisement. A worker there said that it was inappropriate to comment at this time. He said that their boss had previously been interviewed by local Chongqing media already. In a report in a Chongqing newspaper, the reporter said that Ms. Liu of the advertising agency admitted that their worker downloaded a photo of Li Yuchun from the Internet to use to create that advertising poster. She emphasized that there was no malice in producing that advertisement and they did not want to demean Li Yuchun. When the photo of the advertising poster was posted on the Internet, it quickly became the subject of gossip. Li Yuchun's management agency Tianyu Entertainment noticed it too. When our reporter called Tianyu Publicity Manager Tao Yi, he was still seething with anger. "First, we do not think that this was a good advertisement. We want the other side to provide a clear explanation. We will decide what to do based upon their attitude. We do not exclude resorting to legal methods to deal with this violation of personal image." Tao Yu said: "People have to be sincere. If your own brother, sister or good friend is misused this way, what will you do? I feel that Li Yuchun is an entertainer who can endure more than most people. She should give more to society. But is this too much to ask from a 25-year-old girl? Is this pressure too much? Are they being fair? Can they imagine what the principal might think?" As for what director Zhu said about "weak awareness of the laws," Tao Yu finds it unacceptable. "First of all, some things are not just legal matters. Even though China is a society ruled by law, some things cannot be solved solely by the law. The law is only the bottom line for morality." He did not believe that the advertising poster "was just a public interest advertisement." "Li Yuchun has done many charitable activities and free promotions on behalf of handicapped children and AIDS. That was positive. But you cannot say this sort of thing is a public interest advertisement without first asking her approval! This is shameful! I cannot believe that the boss of an advertising agency would be so ignorant of the law. After they finish making the poster, don't they have to get it reviewed by the government departments? Can they draw whatever they want to draw, or say whatever they want to say? All media must know that not all advertising is allowed (just as abortion procedures, cockroach poisons or medications)? They cannot cover everything up by saying that they don't know the law. This cannot be used as the excuse." Through searching the Internet, the reporter saw that the netizen opinions were divided into two distinct camps: one side hurled invectives and jokes at Li Yuchun while the other side supported her all the way. The pro-Li Yuchun camp consists mainly of her fans. They are well-experienced in coping with negativity ever since she became famous. But when this family planning poster came out and some netizens made fun of the "neuter gender" of Li Yuchun, they had to calm themselves down. One fan described Li Yuchun as the calmest water drop in middle of the storm. Some fans even comforted themselves optimistically: "The advertisement poster has a completely different explanation. Chuchun is indeed an excellent descendant to continue the family line as a girl." There was one fan who could not understand why Li Yuchun is so frequently attacked: "We feel that 'anti' subjects are coming to attention more often. We call this 'black.' On the Internet, there are people who will never say that anything an entertainer does is good. They spend all their energies on hating people. In South Korea, the 'anti' issue is even more serious. I have many psychiatrist friends. I want to get them to study this." There are also netizens who think that the whole affair should be examined rationally. This netizen said: "First of all, it is definitely wrong for Longsha town to use Li Yuchun's image without her permission. But should the management agency be so angry because Li Yuchun is being associated with family planning? Is that demeaning her character and creating bad social influence? Family planning is not vulgar in itself. Even Pu Cunxin is a spokesperson for condoms!" As for Li Yuchun's personal reactions to the family planning advertisement, Tao Yi said: "I don't know if Li Yuchun is personally aware of this matter. I don't think that she could be totally unaware. But the company's position is not to let her know if we can help it. As an artiste, she is devoting all her energy to the stage. We do not want these unessential matters affect her. If everything works like this, who is ever going get into the entertainment field? At first, people think that anyone who wants to be a movie actress must be subjected to the 'hidden rules.' If those people who love music must be subjected to this sort of thing, then the Chinese music scene is really in sad shape." According to information, Tianyu Entertainment wants Longsha town to take a stand as soon as possible. "No company wants to make money through filing lawsuits. We are hoping for a formal apology in which they publicly express their stand on this matter." According to Longsha town family planning department director Zhu, there is only one family planning advertisement that uses the image of a celebrity there. The girl who created this advertisement "is rueful and aggrieved that her good intentions were subject to so many vicious attacks." She has resigned from the advertising agency. At this time, Longsha town has produced a new family planning advertising poster. It is a very plain poster with just a slogan. There is no image of any celebrity star.